The NASA Nexus for Exoplanet System Science (NExSS) and Astrobiology Program are hosting an Exoplanet Biosignatures Workshop Without Walls to review, frame, and advance the science and technology of remotely detectable biosignatures for the search for life on planets around other stars. Click here for the latest agenda. Click here to download the archived presentations. Click here for information on how to participate remotely. Future exoplanet observations will soon focus on the search for life beyond the Solar System. Biosignatures to be sought are those with global, potentially detectable, impacts on a planet. Biosignatures occur in an environmental context in which geological, atmospheric, and stellar processes and interactions may work to enhance, suppress or mimic these biosignatures. Thus biosignature science is inherently interdisciplinary. Its advance is necessary to inform the design of the next flagship missions that will obtain spectra of habitable extrasolar planets. This Exoplanet Biosignatures Workshop will bring together the astrobiology, exoplanet, and mission concept communities to review, discuss, debate, and advance the science of biosignatures. This process will engage a broad range of experts by merging the interdisciplinary reaches of NExSS, the NASA Astrobiology Institute (NAI), NASA’s Exoplanet Exploration Program (ExEP), and international partners, such as the European Astrobiology Network Association (EANA) and Japan’s Earth Life Science Institute (ELSI). Between these groups, we will have expertise in astronomy, planetary science, Earth sciences, heliophysics, biology, instrument/mission development, and engineering. What are known remotely-observable biosignatures, the processes that produce them, and their known non-biological sources? How can we develop a more comprehensive conceptual framework for identifying additional biosignatures and their possible abiotic mimics? 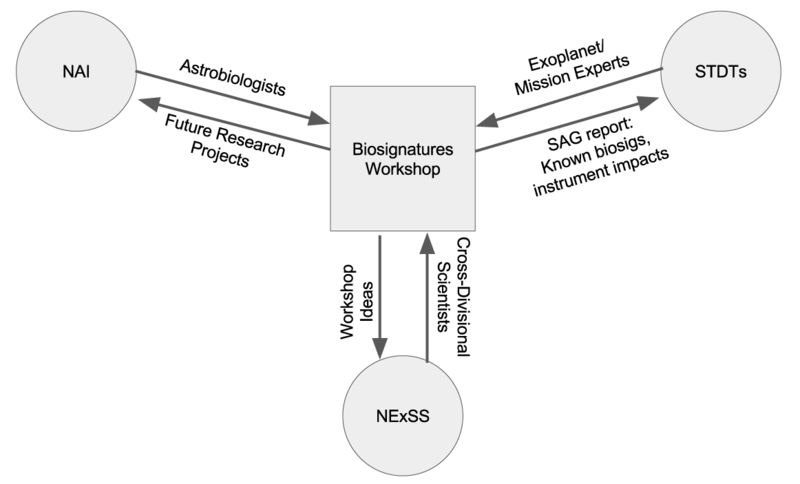 What paradigm informed by both scientists and technologists could establish confidence standards for biosignature detection? The 3-day in-person workshop will be coordinated with pre-workshop online activities to summarize the state of the science of exoplanet biosignatures. This review will provide background for the in-person workshop, which will focus on advancing the science of biosignatures, and understanding the technological needs and capabilities for their detection. This information will be exchanged with the Science Technology Definition Teams (STDTs) of upcoming planet-observing missions. The in-person workshop will include plenary talks to set the stage for small group discussions, which will focus addressing key science questions identified by the Science Organizing Committee. The intent is for the workshop to be highly interactive. The meeting agenda will be posted online approximately 1 month prior to the workshop. Outputs from this workshop will include summary reports, which will be circulated to the community for feedback. These reports will be filed with a dedicated Exoplanet Biosignatures Study Analysis Group (SAG 16) of the Exoplanet Exploration Program Analysis Group (ExoPAG). Participation is limited to 31-35 in-person attendees in Seattle, but online participants will be unlimited for all activities. To register for either the in-person workshop or as a remote participant, please fill out our survey. Goal/work session: After presentation, fill in rubric recording characteristics of biosignatures described in the review. Goal/work session: Continue to fill in rubric with published atmospheric and surface biosignature research since 2002. ⚪ Submit 1 Powerpoint slide (use template) for online book and for video display at venue. ⚪ 10:45 - 12:30: Plenary Activity: What can we measure and/or model? Download presentation files from the above activities here. William Bains - "How can we think outside the box and develop alternative atmospheric biosignatures?" Robert Blankenship - "How likely is it for oxygenic photosynthesis to evolve?" David Catling - "Metrics to find life from remote sensing data & their limitations"
Tony Del Genio - "Modeling 3-D Planetary Climates as Context for Interpreting Exoplanet Observations"
David Des Marais - "Remote Sensing of Planetary Properties and Biosignatures on Extrasolar Terrestrial Planets"
Victoria S. Meadows - "Biosignatures: State of the Science"
Tim Lyons - "Some Lessons Learned From Early Earth: the importance of the environmental context"
Heike Rauer - "Biosignatures: What can we measure now and in the future?" Sara Imari Walker - "Statistical Signatures of Life"
All of our Workshops Without Walls strive to be all-inclusive and as interactive as possible for both in-person and remote attendees. Click the icon to the left to launch the Adobe Connect meeting room. Choose the option to Login as a Guest, enter your name in the field, and then click Enter Room. You will now be able to see/hear the broadcast, and participate via the chat window, which will be displayed prominently in the main room. If you wish to participate via the telecon line, first mute Adobe Connect by clicking the green speaker icon. If muted, the icon will be white. Dial the following telecon line: 1-844-467-4685, passcode: 5947549553#. To keep background noise to a minimum, please mute your phone's mic when not speaking. Each pre-workshop event will have live notes via Google Docs. Click the icon to the left to launch the live notes for this event. NExSS is a coordinating body formed in 2015 whose goal is to foster an interdisciplinary network of researchers spanning astrophysics, heliophysics, planetary science, and the biogeosciences, within the Solar System and beyond, who, through inclusive community activities and cross-discipline collaboration, seek to advance exoplanet science and discovery, and the search for life in the Universe.